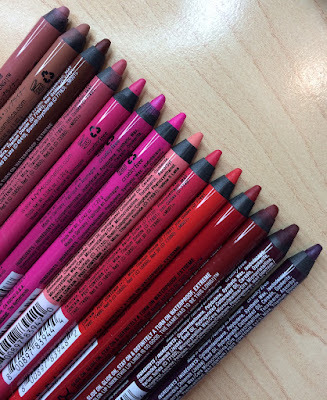 I've said more than a few times that I love jumbo lip pencils, so I've been thrilled to see more drugstore brands like Revlon, ELF, and now Cover Girl coming out with them. Of course they can't have a brief name... Cover Girl calls them "Lip Perfection Jumbo Gloss Balm." The product claims to give "sheer color, soft shine." Frankly, I think my deeper shade gives pretty full color! Both give just a subtle shine. Texture-wise... they're a little less moisture packed than Tarte Lipsurgence or Revlon's lip butters, but seem to have a little more moisture than Revlon's Just Bitten Kissable Balm Stains. These Cover Girl jumbo pencils don't seem to last quite as long on my lips as the Balm Stains do. Similar to most jumbo pencils these days, you don't sharpen them, but instead twist the bottom to get more product. The shade names must have been on the wrappers, which are long gone at this point. But the lighter one is #210 and the deeper is #255. For some reason, this pink (#210) seems to have just a little more peachy tone when I see it on my lips in person, but either way, it's a very pretty color. The berry shade (#255) is my favorite of the two. Love how saturated the color is! Please excuse my strange expression LOL! Bottom line: I enjoy these new jumbo pencils! They're very comfortable on the lips, and while the staying power isn't amazing- I never really mind refreshing my lip product after a meal or lots of talking or whatever. I'd be interested in trying some other shades. The one downside to these twist-up jumbo pencils is that eventually, they lose their pointed tip- and because you're not sharpening them, they remain kind of rounded-off after awhile. Still definitely usable, but just something to keep in mind. P.S. If you're interested in the makeup I'm wearing in this post, stay tuned for my next tutorial video! Shot a vlog this morning while Cupcake was acting out. It just uploaded! I can also listen to my iPod music out loud & sing along and nobody cares! Current favorite songs: Taylor Swift's "I Knew You Were Trouble", Rihanna's "Diamonds", Pitbull's "Don't Stop the Party", and Sarah Darling's "Home to Me". LOVE that we get to hear more from you! I hope you are enjoying your new "normal" life! Im so happy for you! Look forward to seeing a lot more videos! Seems like all the companies are jumping on this "jumbo stain" pencil thing. How do these stack up to the other brands? I haven't bought one yet because I'd like to see some comparisons first though I do stop by the look at the Revlon ones every time I'm in the store. I love the revlon lip balm. Just wondering, how much do these cost? I will be checking these out soon :) Im looking forward to seeing more of you! These sound interesting for sure. The colours look really pretty on you! I'm not a big Taylor Swift fan, but I love that new song, too! It's just so catchy. 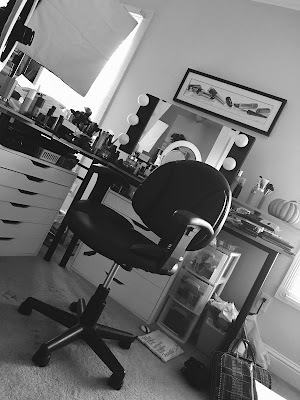 i love your make up!! Glad you're living the normal life again. It's been way too long. Hope to see you at the CrossRoads! Take care. I totally understand getting teary eyed from the normal things. My whole life I just wanted it to be slightly more normal. I was born into chaos and when I have those normal moments, it's magical. Super happy for you and your enjoyment of some normalcy. Yay! So excited to see and hear more from, especially with the upcoming new year! My how time has flyer by. I'm happy for you Emily. I know what it's like to not have a "normal" schedule. I'm happy for you Emily. I know what it's like not to have a "normal" schedule. Enjoying the updates! Now I want to go out and try some of those lip pencils. wow! I really wanna try that covergirl product. if anyone is looking for another fun blog to checkout it would be awesome if you would checkout mine! I like both of the colors of lip balm,but of course the lighter shade of lip balm might look funny on my complexion. How much do Cover Girl lip balm cost? I love the Revelon ones and cant wait to see how these stack. I was at Ulta yesterday and did not see them, where did you find yours. I'll check CVS and Target. Thanks for the heads up. I just bought a couple of these the other day. I got Berry Twist and Jam Twist. I'm looking forward to trying them out! Love the colours of the lipsticks! To keep the "point" on my Revlon Just Bitten Kissables, I apply color using the sides of the product. I also purse my lips around the pointed end of product and wiggle the product a little, so that more color will be placed on the inner part of my lips than on the outer edges. It is much more easily demonstrated than described, lol. I love how those look on you :) I bought the pink shade just a couple weeks ago and I love it! I'll have to get some more of those. 2- أما اذا كان العفش يحمل كثيراً من الألوان والتفاصيل،فيمكن إختيار لون فاتح من الألوان المخصصة بالأثاث لطلاء الجدار, مع انتباه ألوان الأرضيات. Christmas and Birthday and Wedding... Oh My!